The Butch Cassidy Daybill with a reddish background and NRC censor details is one of the most commonly misrepresented Australian movie posters. 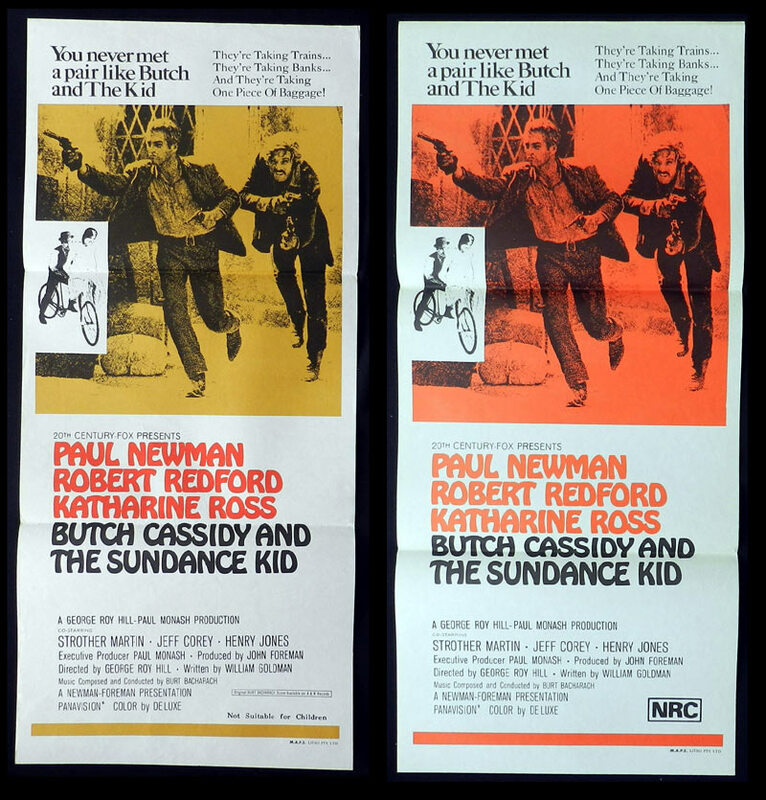 Experienced collectors will be aware that the original Butch Cassidy daybill has a yellowish background with the "Not Suitable for Children" censor details in the lower rh side of the poster. Butch Cassidy and the Sundance Kid was an incredibly popular and iconic film and many people, who would not normally collect movie posters, have purchased a poster for their favourite film believing that it is from the original release. Sadly, a large number of the posters that have sold on ebay have been for the version with the red background which is clearly a reissue from the 1970s. Australian daybills are generally undated and it is sometimes difficult to determine the exact time of release. Censor ratings are a good clue but the average buyer will depend on the seller to describe the poster accurately. Butch Cassidy and the Sundance Kid was released in 1969 in Australia. The Not Suitable for Children is definitely the rating associated with the original release of the film. The ratings system changed in Australia in approximately 1971/2 and the NRC rating on the red background clearly indicates that the poster was released post 1972 - obviously for a re release of the film. Unfortunately, ebay appears to take little interest in misrepresented posters. Collectors can report the listings but it is unlikely that any action will be taken. Sellers often hide behind the excuse that they are only part time or casual sellers and not experts but the end result is that those who purchase the Butch Cassidy daybill, described as original 1969 release, with the red background have been duped.